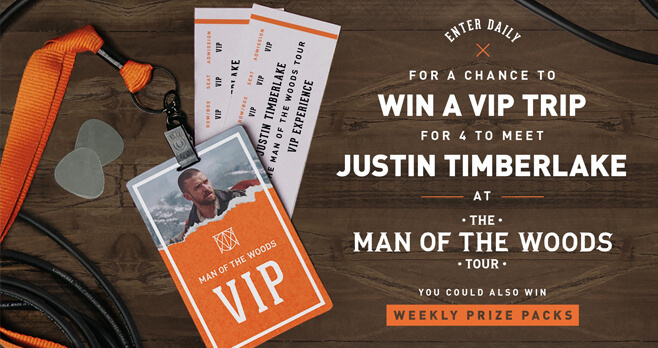 This summer, drink Bai and look for the UPC code to enter the Bai Justin Timberlake Concert Getaway Sweepstakes at drinkbai.com/JTSWEEPS for your chance to win a VIP trip for 4 to meet Justin Timberlake at The Man Of The Woods Tour. You could also win weekly prize packs. Ends: Ends at 11:59:59 pm ET on September 30, 2018. Prize: The grand prize consists of a trip for winner and three guest to Memphis, Tennessee to attend the Justin Timberlake concert on January 12, 2019. Eligibility: To enter the Bai Justin Timberlake Concert Getaway Sweepstakes you must be a U.S. legal resident of one of the 50 United States or the District of Columbia and at least 18 (19 in Alabama and Nebraska) years of age or older at the time of participation. You must be 21 years of age or older at the time of participation in order to be eligible for the Grand Prize.